Why No “How Stuff Works” Articles On howstuffworks.com? HowStuffWorks.com is a great site featuring thousands of articles that uses non-technical language, charts, diagrams and videos how all sorts of complex products, technologies and processes work. Typical articles have titles like “How X works” where “X” can be anything from “OLEDs” to “identity theft“. I recently discovered that How Stuff Works has a mobile site and immediately headed there to check it out. I have to say I was a little disappointed. There’s nothing wrong with the site’s design,it’s easy to navigate and uses browser detection to optimize markup, images and page size to deliver a good experience on everything from old wml-only phones to the iPhone. Although I wish site’s designer’s had applied a style=”max-width:100%; height:auto;” attribute to that logo image to force Opera Mini to re-size it to fit. The problem with the mobile site is the content. Has far as I could see there is nothing there but a few quiz’s and a bunch of “Top 5 This ” and “10 Best That” lists like “10 Best Places for Outdoorsy Types to Live‘ or “5 Myths about Steve Jobs“. How Stuff Works‘ stock in trade, the “How X Works” pieces, seem to be totally missing. I used mobile site’s search engine to look for OLED and “identity theft” and came up with nothing. 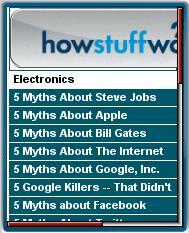 I’ll admit I enjoyed reading some of the “Top 10…” pieces but what ever happened to “How Stuff Works” on m.howstuffworks.com? This entry was posted in Technology and tagged mobile web design, Reference by Dennis Bournique. Bookmark the permalink. Try clicking the “Full Internet Site” link at the bottom of the mobile page. That works for me in Opera Mini 4. Yeah, you are absolutely right. I like the site very much. The real problem for me is the opera mini 4.2 opens only wap site of it, whatever the way i use to enter the site. Atleast OM 5 helps me.